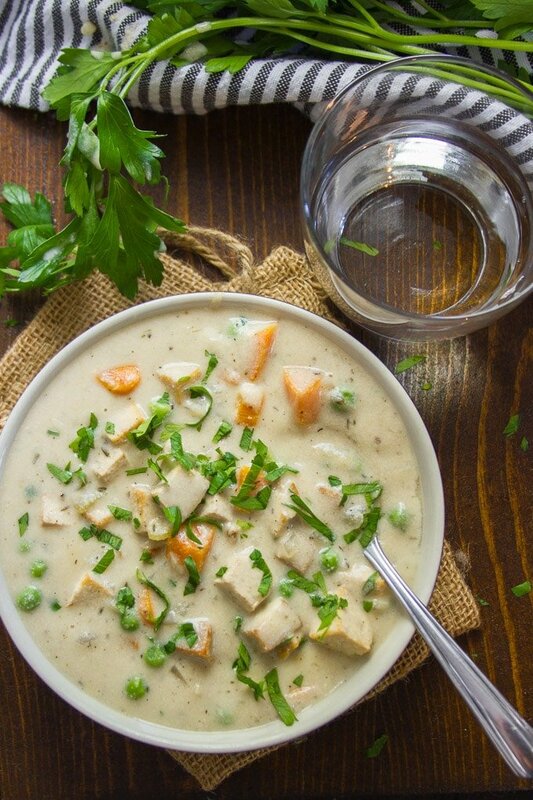 Savory baked tofu, hearty veggies, and a rich cashew cream base go into this luscious vegan spin on cream of chicken soup. 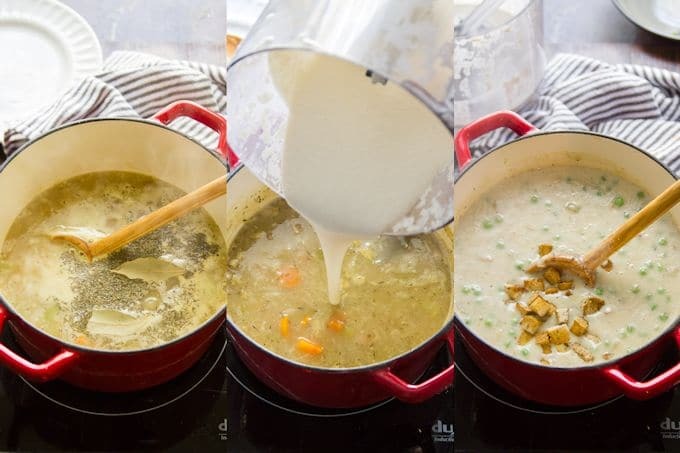 The perfect creamy soup for cold fall and winter days! I know a bunch of people are going to ask me why I need to use “chicken” in the title of this recipe. I’ve address the issue before, but in this case, I think some extra explanation is warranted. The “chicken” in this soup is tofu. And “cream of tofu soup” just sounds like a terrible, terrible thing. As much as I love tofu, I’d never in a million years make cream of tofu soup. Except that I did. I just don’t think of it that way. The tofu doesn’t get creamed (I had some ugly tofu experiences involving the blender back before I knew how to cook tofu). It gets baked! 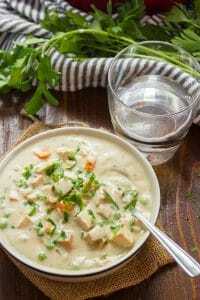 The soup is creamy and it’s loaded with veggies and savory baked tofu in a creamy cashew base. Unfortunately, that’s too long for a recipe title, and I did, in fact model this one after cream of chicken soup. 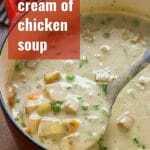 So let’s call it vegan cream of chicken soup. Settled? Good! Oh, and it’s also delicious! 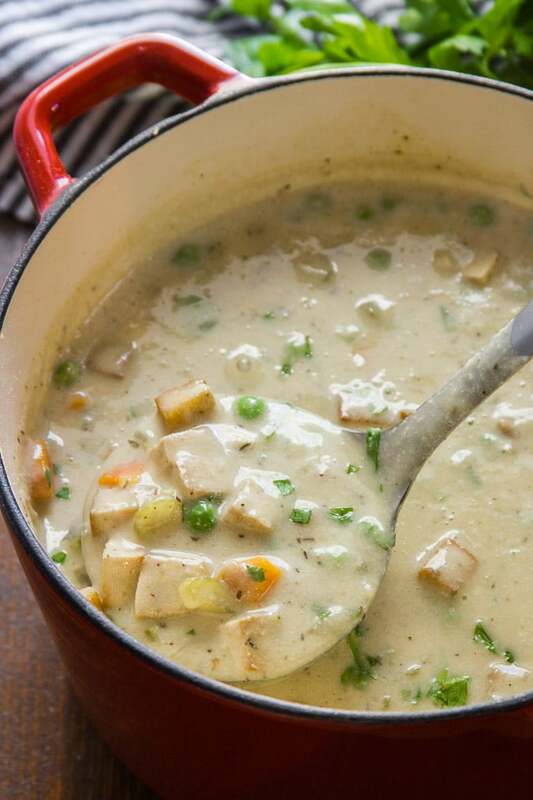 Let’s talk about how to craft this scrumptious soup. 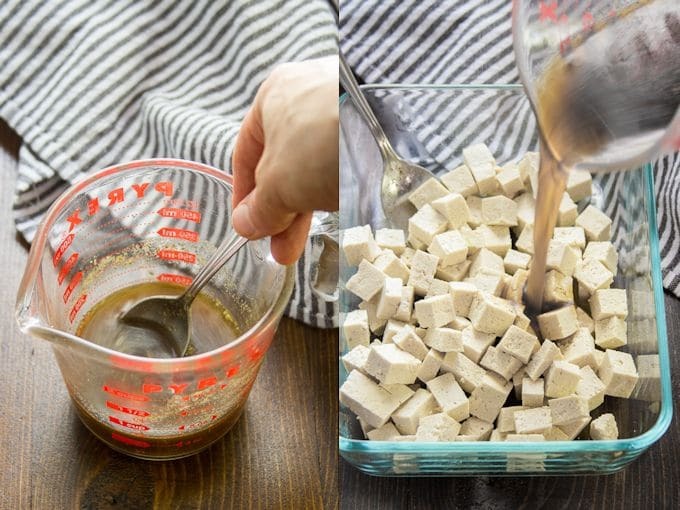 To make the tofu “chicken” you’ll soak some tofu cubes in a savory marinade, and then bake them. Baking gives the tofu a chewy texture and seals in the flavor of the marinade. While the tofu is baking, work on the soup. Start by sautéing some onions, celery and carrots for a few minutes. Once they begin to soften up, add some garlic and a bit of flour (which helps thicken the soup). Cook that for a minute, and then add some white wine. Once the wine has had a few minutes to cook off, you can add your broth and some herbs. Raise the heat to bring everything up to a simmer. While the soup simmers, blend up some soaked raw cashews and non-dairy milk to make your cashew cream, and add that to the soup towards the end of the simmer time. The baked tofu and peas go in last. 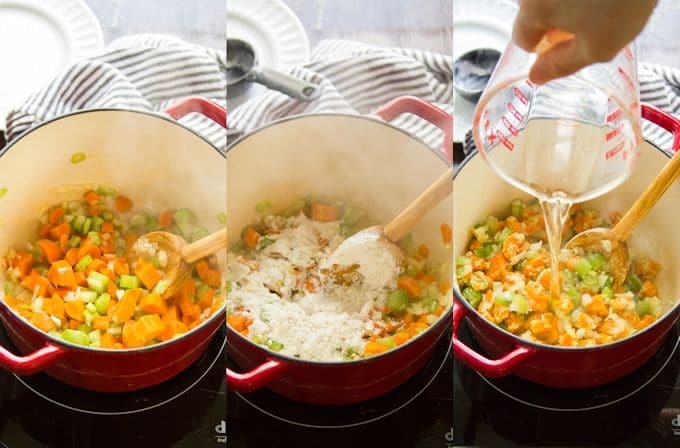 Cook the soup for another minute to heat everything up, and then grab a spoon! If you’re going to have leftovers, I recommend storing the tofu and the soup separately. It’s not totally crucial, but it does help to keep the flavor in the tofu. Not into tofu? Substitute seitan. You can make your own or buy it at the store. No need to marinate or bake it (seitan is already marinated). Sauté it with the veggies if you like, otherwise just throw it it. Forgot to soak your cashews? Try boiling them for 15 minutes. Allergic to cashews? You could probably substitute coconut cream or full-fat coconut milk (like in this recipe) for the cashew cream mixture, but I haven’t tried it, so no promises. Want an alcohol-free version of this recipe? Try an alcohol-free cooking wine (keeping in mind that you may need to use less salt in the recipe), or just leave the wine out. Assuming you’re okay with using wine, check Barnivore to make sure the brand you pick is vegan. Stir the broth, soy sauce, poultry seasoning, and olive oil together in a small bowl. Place the tofu into a shallow dish and pour the broth mixture over top. Stir a few times to coat, and allow the tofu to marinate for at least 30 minutes. Line a baking sheet with parchment paper and preheat the oven to 400°. Arrange the tofu on the baking sheet and bake for about 35 minutes, turning halfway through, until the pieces shrink a bit and darken. Melt the vegan butter in a large pot over medium heat. Add the onion, celery and carrots. Satué for about 5 minutes, until the veggies begin to soften. Add the garlic and flour. Stir so the flour coats the veggies, and continue to sauté the mixture for about 1 minute, until the garlic becomes very fragrant. Stir in the wine and bring it to a simmer. Lower the heat and allow the wine to simmer for about 3 minutes, until most of the liquid has cooked off. Stir in the broth, thyme, sage and bay leaves. Raise the heat and bring the broth to a boil. Lower the heat and allow the mixture to simmer for about 20 minutes, until the veggies are tender. While the soup simmers, make the cashew cream. Place the cashews in to the bowl of a food processor fitted with an s-blade. Add 1/2 cup of the milk and blend until smooth. Blend in the remaining 1/2 cup of milk. When the soup has finished simmering, stir in the cashew cream, then the peas and tofu. You can also thin the mixture with some extra broth or water at this point if you like. Simmer the soup for another minute and remove the pot from the heat. Remove the bay leaves and season the soup with salt and pepper to taste. This looks just like the real thing! 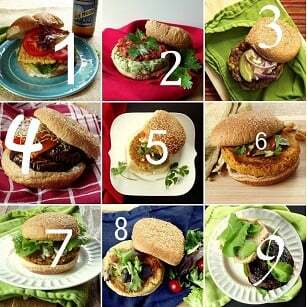 thanks for the share, looks delicious! Hi! If using seitan, does one still need to bake it? Thanks! Nope! You don’t need to marinate it either. You can sauté it for a few minutes if you like, or just chop it up and throw it in. This is delicious and easy to make, so flavoursome! So yummy! I did add in a little nutritional yeast, as I do to all of my soups. Do you think this could be put in the crockpot? I think so, but I’m not sure about the time or setting since I haven’t tried it. Do you think this can be used in recipes where it calls for cream of chicken soup? I’m trying to veganize a chicken and wild rice casserole recipe using jackfruit instead of chicken. So was looking for a vegan cream of chicken soup. I think so! I’d just make sure to chop everything very finely. P.S. – I actually started working on a vegan wild rice casserole recipe last week!